Going paperless can help you organize your home and reduce your impact on the environment. 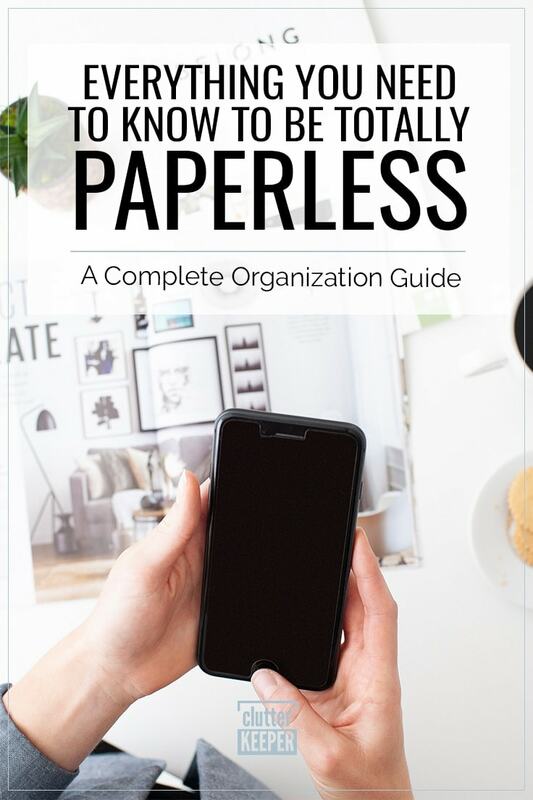 In this guide, you’ll find compelling reasons to go paperless, as well as tips and tricks to help you learn how to go paperless at home and at work! Are you tired of sorting through piles of mail, recycling old magazines, and organizing receipts? Hate searching through your personal files to find the piece of paper you need? Feel guilty at the sheer amount of mail you recycle each week? It might be time to learn how to go paperless! The idea of going paperless is simple. You just need to eliminate as much unnecessary paper from your life as possible. While there are some things you’ll want to keep paper copies of, you might be surprised to see how much paper you can cut out of your life. Going paperless can be a great way to stay organized and help you control your clutter, and there are plenty of compelling reasons to make the move too. Ready to learn how going paperless can help you? Read on to uncover reasons to reduce your paper waste and find actionable tips to help you and your family go paperless. Going paperless is good for the environment. Going paperless almost always means you’ll receive less mail. By receiving less mail, you’ll eliminate your paper waste and reduce the carbon footprint left behind when your letters and bills are shipped across the country. By using less paper, you generate less waste – it’s as simple as that. Going paperless will help you maintain an organized home. It’s easier to keep your counters and coffee tables free from stray mail, magazines, and paper clutter when you don’t have much paper to begin with. Going paperless can be safer and more secure. Have you ever lost an important document in the mail or missed a bill? Receiving important pieces of mail digitally will reduce the potential for human error and guarantee your confidential information stays that way. Plus, you can actually receive “read receipts” online to prove someone received your email. It’s so much more secure than paper mail. Going Paperless is More Convenient. How many times have you needed an important paper – only to remember you left it at home? When you go paperless and store everything digitally, you will be able to access everything in an instant. It’s also much easier for multiple people, all in different locations, to all see the same documents at the same time. These are just a few of the benefits to going paperless. Need more compelling reasons to make the switch? This blog contains lots of great ideas! 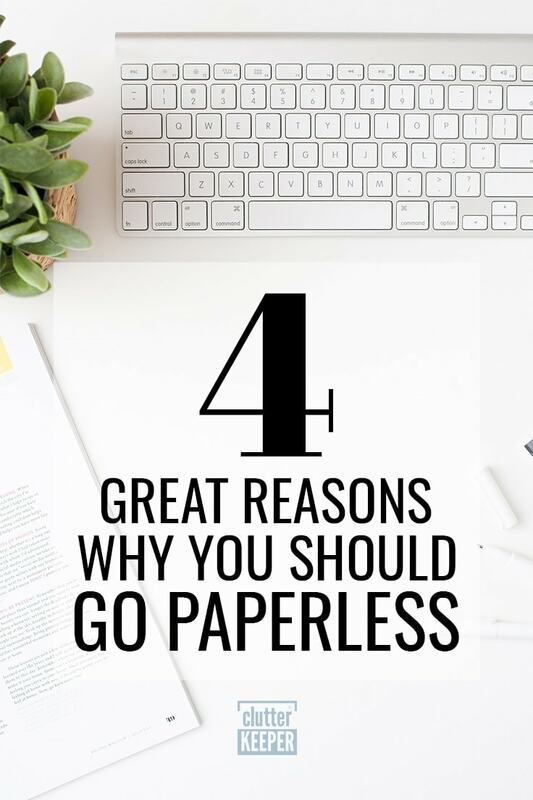 Now that you understand the benefits, let’s look at how to go paperless. The idea of cutting back on paper can be intimidating for some, but the process doesn’t have to be difficult or all-consuming. 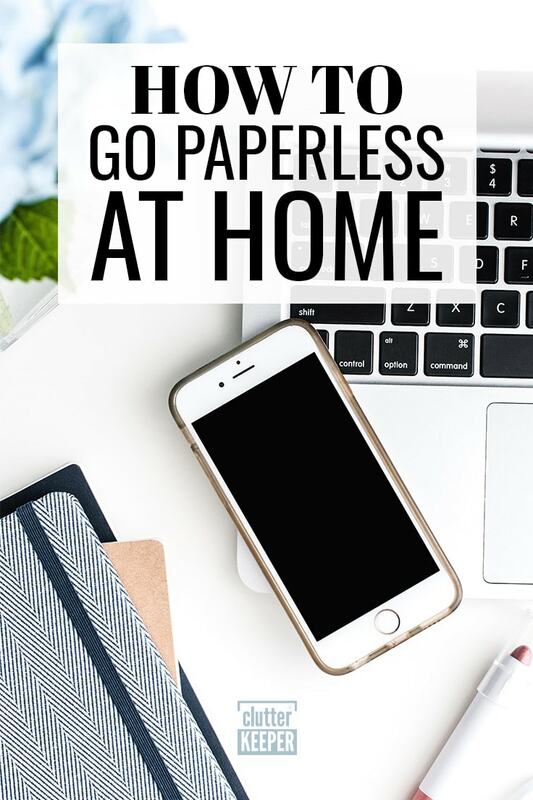 Instead, there are lots of small steps you can take to go paperless at home. If you’re on a mission to go paperless, start with your mail. Many of us still check the mail each day and waste valuable time and energy opening, reading, sorting, and disposing of letters, bills, and junk. Unsubscribe from junk mail. If you’re tired of throwing away so much junk mail, see if you can stop it from arriving. There are websites and services like DMAchoice.org that allow you to opt out of certain types of direct mail advertising. Opt into electronic billing. Very few service providers will actually require you to pay with a physical check – and many will charge you a processing fee to do so. See which bills are still arriving by mail and create an online account to opt into online billing. With a little effort, you should be able to seriously reduce, if not entirely eliminate, the bills in your mailbox. Request digital bank statements. 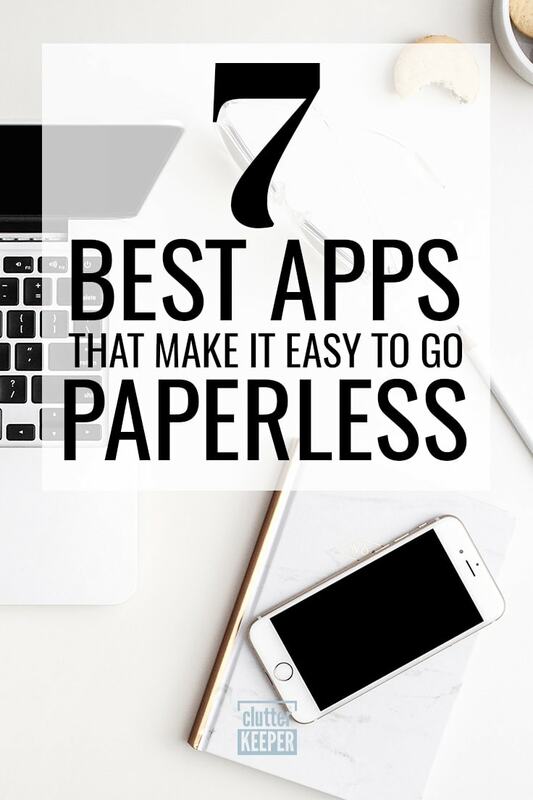 Banks and credit card providers like Wells Fargo, American Express, and others have made it easy to go paperless. You should be able to adjust your preferences through your online banking. If you can’t, a quick call into customer service should let you make the switch. Even if your goal is to be 100% paperless, you’re still going to receive some pieces of mail or critical documents in paper form. You’ll need an easy way to convert these paper documents to digital files. Fortunately, there are lots of simple, affordable scanners on the market that can capture copies of your paper documents and digitize them. Save your digital files in well-named folders to make your important documents easy to find. Need some scanner ideas? Here are some of the best ones out there. Super slim portable scanner – this one will fit on any desk and can be taken with you on the go! Super fast scanner – this one automatically grabs papers at 50 pages per minute! Lightweight, wireless scanner – no wires, it can go with you anywhere. Think about all of the different ways you use paper in your daily life. While mail and important documents may make up the majority of your paper use, it’s not the only source of waste. Cancel your newspaper delivery service. Still reading a paper copy of your favorite newspaper? Cancel it and make the switch to electronic delivery. Subscribe to the electronic versions of your favorite magazines. Unless you love to repurpose old magazines, see if you can switch your magazine subscriptions to the Internet. Read them on your Kindle, your iPad, or your preferred e-reader or tablet. Ditch the Post-Its and paper lists. Take advantage of electronic note-taking and to-do list apps, like Trello, Google Keep, or Evernote to organize your priorities and to-do’s. Stop printing maps, directions and boarding passes. Use apps like Google Maps to navigate from Point A to Point B, and access boarding passes and travel documents on digital apps. Use app versions of daily tasks. Think about your daily activities that involve papers – there is probably an app that could replace it. The biggest tip for going paperless is to replace your everyday tasks with something computer or app-based. These are the most popular productivity apps and the problems they solve. Whether you use paper for calendars or budgeting, there really is an electronic solution for it. Whether you have an iPhone or Android, Cozi Calendar works seamlessly. It is the most effective calendar app out there. The best thing about it is how you can synchronize calendars with all the family members in your home. You can ditch the paper calendar and actually send alerts to specific family members about upcoming events. It is such a powerful app. Wunderlist is a super-powerful to-do list app. You can actually collaborate with it, prioritize tasks, and receive custom push notifications to keep you on track. Another fantastic thing about Wunderlist is how you can categorize your lists. So you can have one folder for your grocery list and another one for your work reminders. Keep everything separate and organized. Instead of printing out boarding passes, you can save all of them to your TripIt app. It tracks itineraries, and sends helpful alerts and reminders to help you stay on schedule. The next app that will help you go paperless is You Need A Budget – YNAB. Easily track your spending and plan ahead for future expenses all with this simple app. It is both web-based and app-based and you can use it as a family. Not only does budgeting prevent you from overspending, but it can help you save up for larger purchases later on. And with this app, you don’t have to do math or try to read your handwriting in a ledger. Small business owners, how do you track your mileage for taxes? If you still try to use a notebook, you have to check out MileIQ. You don’t have to remember to write down any numbers. It automatically uses your phone’s GPS to track all of your drives. Then, you just swipe left for “personal drive” and swipe right for “business drive.” You can categorize them and even auto-track frequent trips. For example, if you drop your child off at school every weekday, you can tell it to automatically categorize those drives as personal. MileIQ then creates a report for your accountant at the end of the year. Tracking mileage couldn’t be any easier! How do you organize all the files you scan when you go paperless? The best app for organizing all your papers and online information is Evernote. When you scan documents, you can assign notebooks. These documents then become searchable! This is wonderful. Because now not only are did you make your papers electronic, but you cut down the time it takes to find important information in those papers. How often have you wished you could just hit “search” in a paper contract to find a specific word? Now you can. And Evernote can be shared with users. You can also write on uploaded documents. This app is a workhorse. If you are going paperless, keep this app in mind. Finally, start sending out invitations electronically to cut down on paper waste. Track RSVPs and send out beautiful party invitations with Punchbowl. They have a huge variety of branded invitations that look just like paper ones. You can also send them via text, if you are afraid their invitation will go to spam. Don’t forget to keep your phone organized so you can find the app you need when you need it. These organizational tips will have your device in shape in no time. 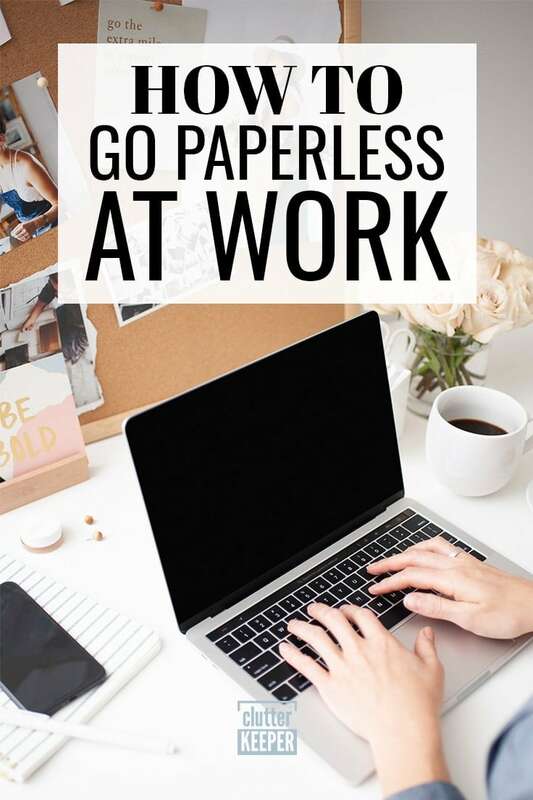 Now that you’ve learned about ways to go paperless at home, you may be wondering – how can I go paperless at work? Ask your colleagues for “soft copies” (Word documents and other digital files) instead of “hard copies” of draft documents. Embrace digital organization tools, like Trello, to track tasks and replace your paper to-do lists. Invest in a program to capture electronic signature, like DocuSign, to reduce the need for on-paper signatures. See if you can stop printing employee handbooks and other new hire documentation. Instead, save these files online and provide new hires links or digital downloads. What should you keep on paper? 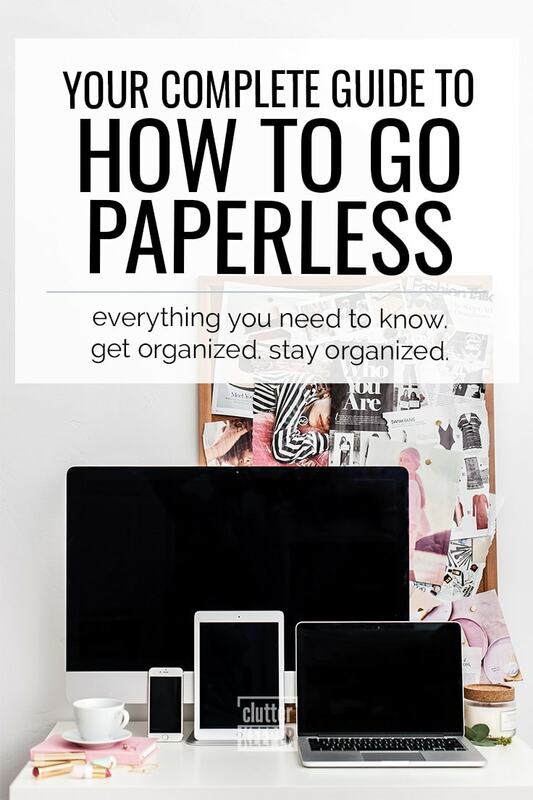 When you go paperless, is there anything you should keep? Yes, don’t totally discard 100% of all papers in your home. These are the documents you should keep. Legal Paperwork – Sometimes courts will require a notarized or official stamped copy of legal documents. Keep these in a fireproof box. Examples include marriage certificates, birth certificates, divorce decrees. Memories – If there is something handwritten, you can scan it just in case something happens, but keep the originals. Memories and sentimental items are incredibly important. Deeds and bills of sale – Keep anything that legally proves ownership. Wills and Living Wills – Always keep all wills and living wills in a fireproof box. Dave Ramsey has a complete list of which important documents to keep and for how long. It’s a very thorough list. Almost everything on that list can be scanned and kept in your online storage folders, so keep that in mind as you read that list. Are you overwhelmed with all this information? Don’t be! 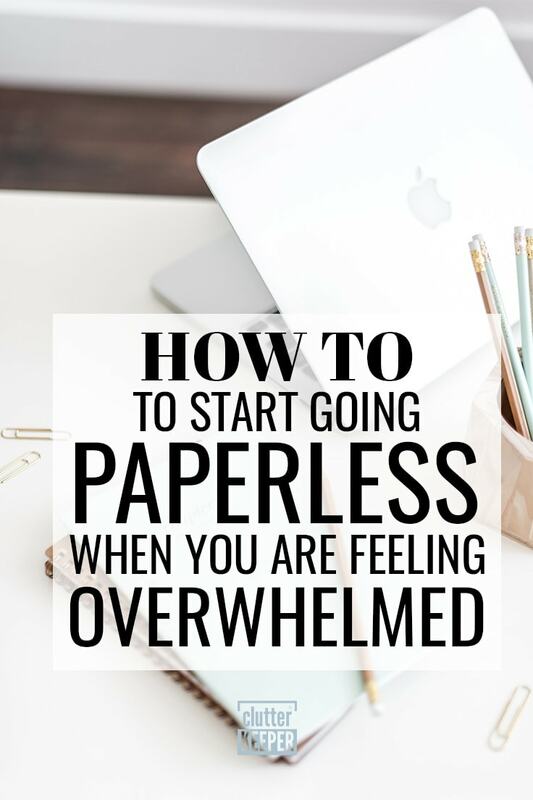 You can take your time going through all your papers and achieving “paperless” status. Here are some tips that will help you if you just don’t know where to begin. Set small goals. Make these goals achievable, so you minimize your stress. Scan current papers one week, sign up for digital statements the next week. Do things your way. Maybe the apps in this post don’t work for you – use what works. Find a solution that works with how you operate. Do it with a friend. You’ll be more successful if you try to go paperless with the support of a friend or spouse. So get them involved with you! As you can see, going paperless doesn’t have to be a difficult process. By making a few simple changes and consciously trying to reduce your paper use, you’ll reduce environmental waste and cut back on paper clutter in your home. 10 Simple Ways to Reduce Paper Clutter Today – find more helpful tips to manage your paper clutter here! How to Finally Get Your Mailbox Clutter Under Control – check out some smart tips to reduce the amount of paper coming through your mailbox. KonMari Method of Home Organization: Your Complete Guide – the Konmari Method can be applied to your paper clutter, too!